Perfect for professional, er, lizard watchers? 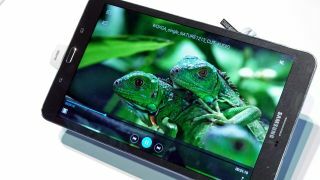 Samsung's Galaxy Tab Pro series was unveiled at CES 2014, and we're just now getting word of how much the slates will set you back in the UK. The Galaxy Tab Pro 8.4 Wi-Fi only model will leave a £349 sized dent in your bank account, while the Tab Pro 10.1 comes in at £449. If those prices sound reasonable to you, head over to Samsung's website where you can pre-order the tablets now, ready for deliver on March 6. No word on pricing for the surprisingly decent foot-long 12.2-inch model, unfortunately - we'll keep you posted.